Dr. Joseph Aoun, a distinguished linguistics scholar, and the seventh President of Northeastern University, is the recipient of the 2011 Robert A. Muh Alumni Award, presented bienially by MIT’s School of Humanities, Arts, and Social Sciences. 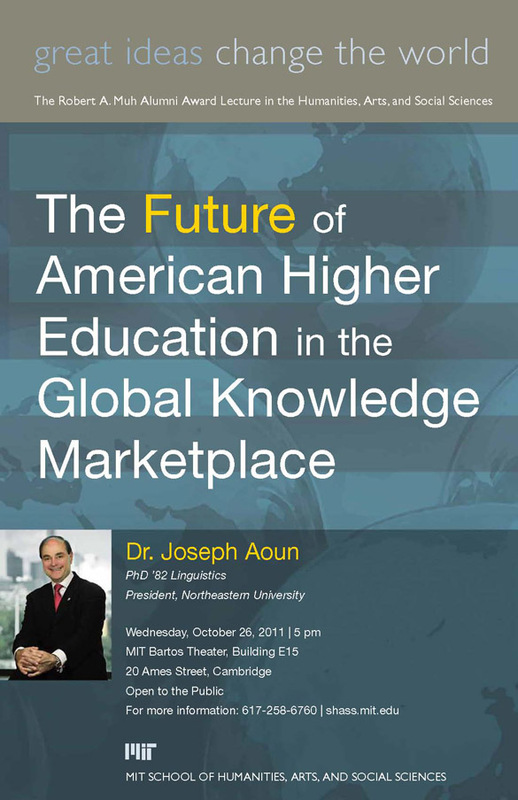 Dr. Aoun's award lecture is on "The Future of American Higher Education in the Global Knowledge Marketplace." Speaking of the award, Deborah Fitzgerald, Kenan Sahin Dean, said, "The Muh Award is a singular opportunity for us to recognize MIT graduates who have made extraordinary contributions, and whose life work calls on deep knowledge in the disciplines of our School. We are delighted to present Dr. Aoun with this year's award." Linguistic scholar and President of Northeastern University, Dr. Aoun is a highly respected voice on the value of global and experiential education who has enhanced Northeastern's signature co-op program with opportunities around the world. President Aoun came to Northeastern from the University of Southern California's College of Letters, Arts & Sciences where he was the inaugural holder of the Anna H. Bing Dean's Chair. He received his Ph.D. in linguistics from MIT, and advanced degrees from the University of Paris VIII and Saint Joseph University (Beirut, Lebanon). In 2006, the French government presented him with the Chevalier dans l'Ordre des Palmes Academiques. He is a member of the American Academy of Arts and Sciences, and in 2012, will become Chair of the American Council on Education. He is a fellow of the Linguistic Society of America, and a recipient of the USC Associates Award For Creativity in Research and Scholarship. The Muh Alumni Award was founded and endowed by Robert A. Muh '59, to honor MIT graduates for significant achievements in humanities, arts, and social sciences fields. Muh, who serves on several SHASS visiting committees, is also a life member of the MIT Corporation.